The Victoria pegboard is constructed from 20 gauge, type 304 stainless steel, polished to a #4 finish. The “V” style pegboard comes in 14 standard sizes and a variety of mounting options. 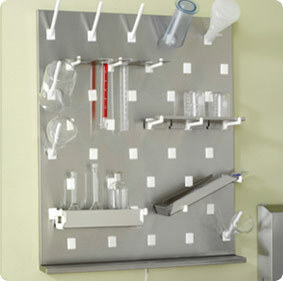 Victoria pegboards are designed with an integral drip trough. All boards come standard with a wall bracket, standard 6” white pegs and 3 ft. of clear plastic drain tubing. Custom sizes also available.